I'm having a major DUOCHROME moment here, guys. When I see how fun a layering like this can be, and just how much the whole look shifts depending on the angle of my hands, I want to buy more. 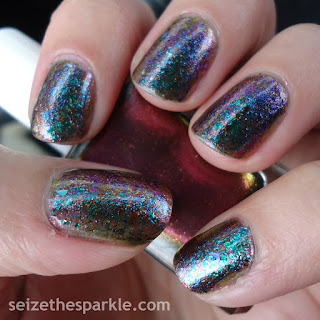 All the duochrome polishes, and let's throw in some multichromes for good measure, too! 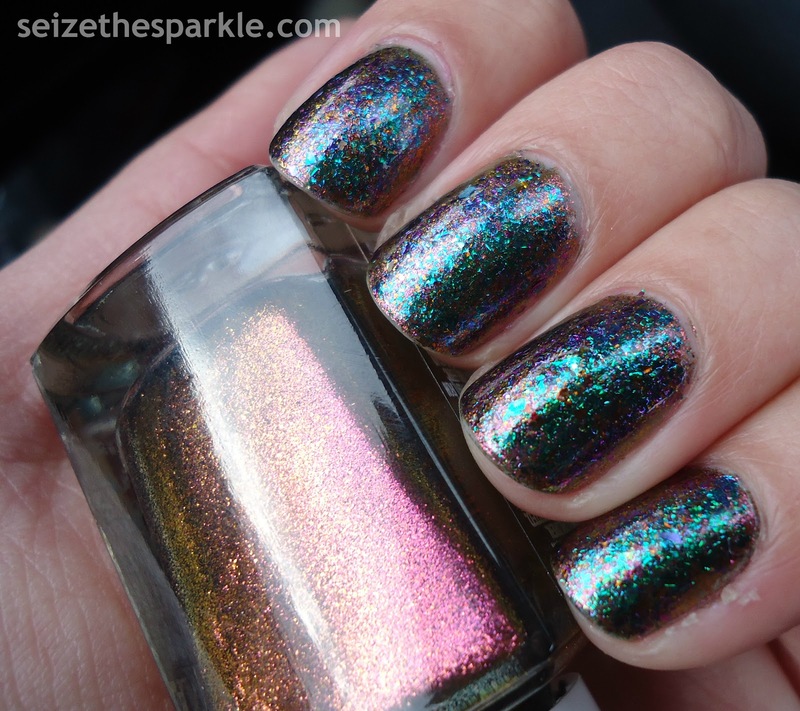 And just in case you're wondering what in the world I'm talking about when I say duochrome and multichrome, let me clear things up for you! 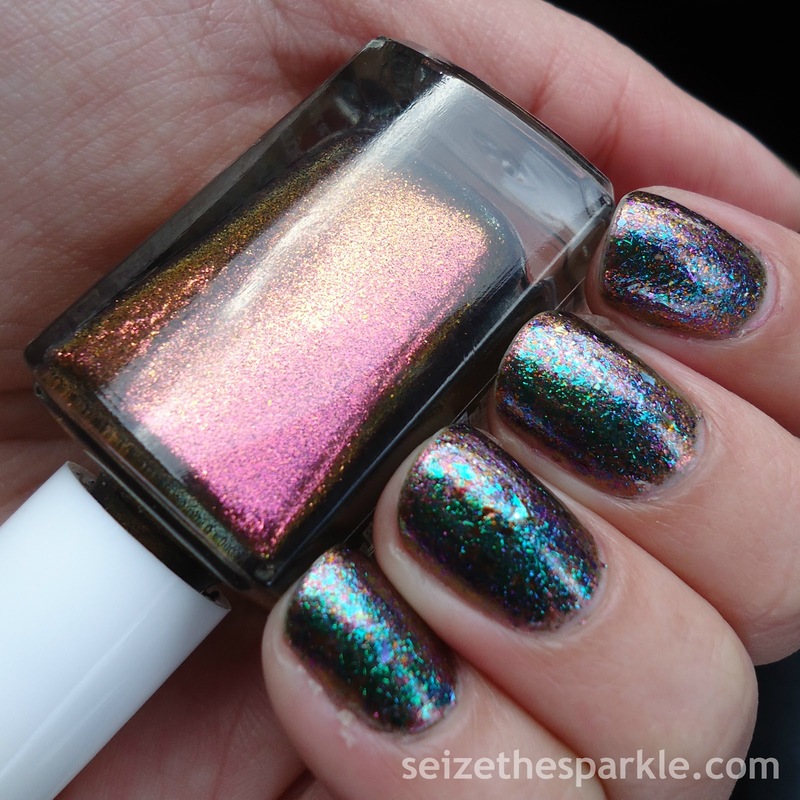 Duochrome and multichrome polishes are color-shifting polishes. Duochrome polishes shift between two colors, while multichrome polishes shift between three or more shades! If I had to guess, I'd say that I have 20-30 duo or multichrome polishes in the sparklestash. I'm always eager to add new color combinations, but there's a lot of repetition out there. The ones that I do have, I love, and Hard Candy Beetle is no exception. When the line debuted at Walmart a few years back, (complete with rings!) I couldn't wait to get my hands on a bottle. Hard Candy polish was both not available and not in the budget during my teenage years. Definitely a little bit of sentimentality there. Beetle is a teeeeechnically a multichrome polish, because it flashes from maroon to orange to gold to green. BUT... the strongest part of that flash is from maroon to gold. Sooooo... DUOCHROME. Straight on, you get a red leaning coppery color, but at an angle you can really see the flash to gold! Look On The Night Side is a duochrome flaky glitter topper that flashes turquoise green to purple. When you look at it straight on, you get a bright flash of the turquoise green, then you get the purple as you tilt your nails down. Also, depending on the light, that turquoise green does sometimes translate as a vivid kelly green. Now, we all know that I could've stopped there, but what would the fun be in that? So, I added a coat of Autumn People by Pahlish. That added a few little multi-colored specks of resistance to Look On The Night Side. I mostly see the red ultrachrome flakes, a few of the chameleon flakes and definitely the neon purple shimmer. Another Friday is here, and I'm so excited that there isn't a single flake of snow in the forecast! We really got hammered last weekend with a ton of snow. Slowly, we've been digging our way out and getting back to normal. It is supposed to warm up to mid 40's by Monday, though, and I am not going to complain one bit! Since we were so cooped up last weekend, I just want to get out and about this weekend. Also, a certain curly headed little someone keeps reminding me that I have run out of potty treat surprises. So, I'll be searching for those while meandering my local haunts, just enjoying being out of the house!